Many of us are aware of the doctrine of the priesthood of all believers. This was an instrumental doctrine established at the time of the Reformation. Whereas the Roman Catholic church was teaching that God’s grace was mainly mediated through the class of bishops and priests, Martin Luther and the reformers began to see that Scripture taught something quite the opposite. Therefore, we have access to the throne of grace through the blood of Christ (Hebrews 4:14-16; 10:19-25). We are not striving to get to this place. We are already there because we are in Christ. Most beautiful! Yet, though many are aware of this important doctrine within the evangelical church, most have never considered that the Scripture lays out the doctrine of the prophethood of all believers. Peter has a revelation that what Joel had prophesied centuries before was now being fulfilled right in their midst. Joel had declared that, in the last days, the Spirit would be poured out on all flesh (Joel 2:28-29)! Thus, Peter was declaring that the last days had come upon them right then and there. The last days were not some 100-year period or 50-year period before Christ returned, nor a 7-year period of tribulation before His coming. 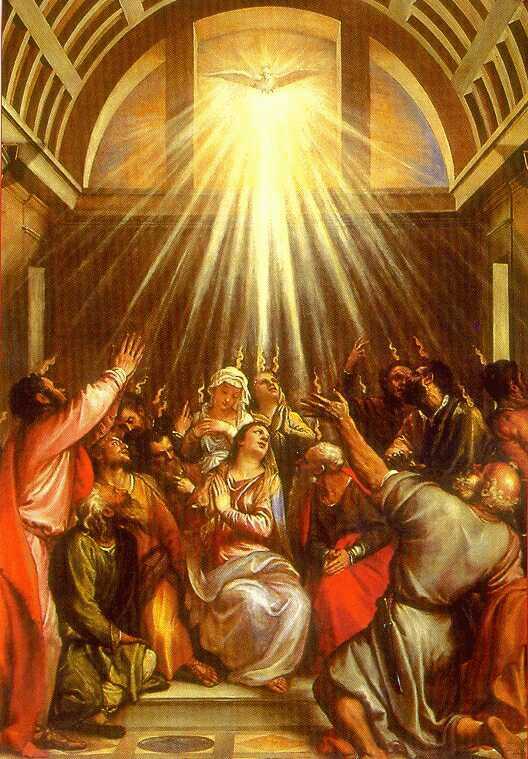 Peter declared that they had now entered the last days and the evidence for this was that the Spirit was being poured out on all flesh. No longer would there be a gender divide in regards to the work of the ‘Spirit of prophecy’ (a term used to describe the Spirit during intertestamental Judaism). Peter declared that both sons and daughters, both males and females would both be included in this great work of the Spirit. And there would be no more age barrier either. Both young and old were to be included. The Spirit was now available to all of God’s people, not just a select few. In general, in the old covenant, the Spirit of God would come upon a person for a particular task and would most times withdraw until needed again for another specific task. We see examples of this specifically with the judges: Othniel (Judges 3:10); Gideon (Judges 6:34); Jephthah (Judges 11:29); and Samson (Judges 14:6, 9; 15:14). But, with the new covenant, the Spirit would now be poured out on all flesh, that is all of God’s people irrespective of gender, age, social status, etc. With the Messiah seated at the right hand of God, He could pour out the expected blessing of the Messianic Age (Acts 2:33). And, with the inauguration of the new covenant, the Spirit would settle upon, or within, God’s people on a permanent basis! Thus, by their very Spirit-nature, the people of God are called as a prophetic community. Therefore, each and everyone of the Spirit empowered people of God can be used in prophecy, as Paul also hints at with the Corinthians (see 1 Corinthians 14:5, 31). I believe this may be the reason why Paul seems to declare in 1 Corinthians 14 that prophecy and tongues are the two most readily available charismatic gifts of the Spirit within the gathering of God’s people. Even a message in tongues functions as prophecy when it is followed by an interpretation (see 1 Corinthians 14:5). But, still, the purpose is not to simply utter a particular prophecy. The purpose is that our entire lives, both speech and actions, become a prophetic sign to a hurting and unbelieving world. To be prophetic ultimately means that we communicate the heart of God, we communicate His words. And it is the prophetic community of believers who are called to do such this, whether we are gathered together in worship, working at the office, having coffee with a friend, at the cash register (till) of a store, or wherever we find ourselves. This is our prophetic call as the body of Christ. Thus, not only should we embrace the important doctrine of the priesthood of all believers, but we should also recognise that the Scripture declares the prophethood of all believers. Such is amazing news! Such is also challenging! Nevertheless, this is our call as Spirit-empowered believers and, so, let us prophetically live our lives as a testimony to Jesus. This entry was posted in Gifts of the Spirit, prophecy and tagged Gifts of the Spirit, prophecy, prophethood of all believers. Bookmark the permalink. Greetings Scott, (You directed us from the Credo Blog). First things first. Scott, I honestly want to agree with you, however, I feel I cannot and I do not think it is stubbornness in my own heart. I honestly do not find the Joel passage convincing. First, I think he explains “all” by the following lines, “sons”, “daughters”, “young men”, “old men”. Your right, the gender distinction is done away with. Also, there is now not just ‘one prophet in all of Israel’. However, I do not think it is to every believer–I do not think the rest of the New Testament will bear that conclusion. Paul says “Pursue love and be eager for the spiritual gifts, especially that you may prophesy” (1Corinthians 14:1). He also says different gifts, such as the gift of prophecy, is distributed to different individuals (Romans 12:6). I cannot find any indication in Paul that we are all prophets. Please seriously consider those passage (1Cor 14 in its entirety, and Romans 12:6-8), and then write to me. Please let me know how my statements relate to what you are saying. Thanks for stopping by and commenting. There are many ways to approach this, but I will try and communicate some things. How does one establish the priesthood of all believers? I know we can easily quote 1 Pet 2, which I’m fine with. But one verse? Or is there a sweeping reality of what it means to be in Christ? Who is Christ? The thing most any simple theology underlines, noting the precursor of the OT, is that Christ is prophet, priest and king. He is that, truly. And, so, for those in Christ, guess what happens? They become a priesthood, a royalhood, and a prophethood. You can’t get around it. Not because we quote a verse here or there (though we can for each of these 3 aspects). But because we recognise the nature of Christ and then what implications that has on those who are in Christ. The same is true of a current series I am posting here on this blog. Christ is all 5 ministries spoken of in Eph 4:11-13 (apostle, prophet, evangelist, shepherd and teacher). He sends his Spirit to continue those same exact ministries. And because Christ is all 5, his body is called to be all 5 ministries in all of the world. There are specific people gifted in these areas, but the whole body of Christ is called to be apostolic, prophetic, evangelistic, shepherding, teaching. We can’t get around it because that is who Christ is. And he fully expects his body, empowered by the Spirit, to carry on all his ministries. What he did and taught was simply the beginning (Acts 1:1). I appreciate your reply and I fully appreciate your reliance on the doctrine of us being made part of Christ. That doctrine is so important. However, I really need you to explain to me what Paul is talking about when he talks about prophecy and how it relates to what you are saying. Is Paul talking about a different capacity? I believe that, as passages like 1 Pet 2:4-10 relate to the priesthood of all believers or passages like Rev 1:6 & 5:10 relate to the royalty of all believers, so does passages like Acts 2 & 1 Cor 14 relate to the prophethood of all believers. Paul encourages us in 1 Cor 14:1 to eagerly desire gifts of the Spirit, especially prophecy, then in vs5 he says he would like us all to speak in tongues, but even more to prophesy. Vs26 says that when we come together each one has something to bring, and I believe this is referring to things more spontaneously and prophetically focused (i.e. prophecy, a spontaneous song, word of knowledge, word of wisdom, tongue, etc). Vs31 likely also instructs how we could each be used in prophecy. So, in the end, if one is indwelt and empowered by the prophetic Spirit (and I suppose we all are, or should be), then we can all be used in prophecy. I am not a prophet, more a shepherd-teacher. But God has used me to prophesy before. I think it a reality of our prophethood as the body of Christ and even specific passages. I hope that shares a bit more.